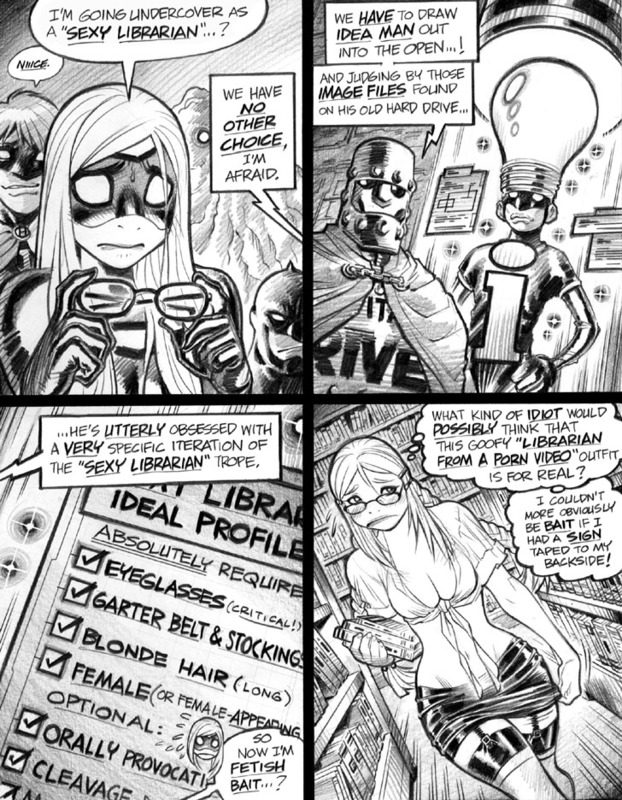 Panel 4: A somewhat rare use of thought balloons in this panel, which is a storytelling trope that I don’t use all that often in Empowered—as opposed, though, to most of my other work, in which thought balloons almost never appear. I should note that thought balloons have been out of fashion in North American comics writing for decades now. I never really used them all that often to begin with, as I generally preferred the use of narrative captions, as in comics projects like Bubblegum Crisis: Grand Mal, Iron Man: Hypervelocity and Galacta: Daughter of Galactus. Interestingly, the English translation of one manga in particular made me rethink my antipathy towards thought balloons: Maison Ikkoku, in which the great Rumiko Takahashi brilliantly used ’em to highlight the often stark differences between what Kyoko and Godai were saying to each other and what they were really thinking. In the end, I didn’t wind up actually using thought balloons any more often in my work, but Takahashi’s adept usage of the trope at least made me appreciate the narrative idiom a bit more.